The ReadyRails™ static rail kit for 2U Systems, including PowerEdge R720 provides tool-less support for 4-post racks with square or unthreaded round mounting holes including all generations of Dell racks. It also supports tooled mounting in 4-post threaded racks and 2-post (Telco) racks for added versatility. 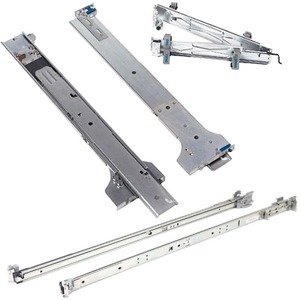 The static rails support a wider variety of racks than the sliding rails but do not support serviceability in the rack and are thus not compatible with the CMA. This product has been tested and validated on Dell systems. It is supported by Dell Technical Support when used with a Dell system.